Zooey Deschanel is still the new girl. What was at first perceived as an innocent request to curb the over-documenting culture that concert-goers have become hyper aware of in recent years soon revealed itself to be a draconian approach to image control when a strict no camera policy demanded by Zooey Deschanel and M. Ward’s group was (passive-) aggressively enforced by a pre-recorded message, flyers posted earlier in the day, and then security guards accosting any front row listeners lifting LED-bejeweled smart phones into the air (and all of the people immediately surrounding them) with flashlights and wagged fingers. It placed She & Him audience members in a sour state, and for many, one that wouldn’t be cured by the band’s set. While M. Ward and his backing band are exceptional musicians seasoned to the stage, for an actor whose quirky onscreen qualities are (if polarized) celebrated and whose album work with M. Ward is the stuff of sugary charm, Zooey Deschanel’s performance at Toronto Urban Roots Fest revealed that the actress hasn’t taken to the stage quite as comfortably. Talented no doubt, Deschanel played song portions on piano, tambourine, and miniature guitar throughout the night, but to say that She & Him made up for the root assault on its fans’ freedoms with its stage show would be an exaggeration. Just a suggestion: maybe it would’ve looked better from behind 3.5-inch screens. Also, if you’re demanding no cameras to keep your live show off the Internet, make it a good show. 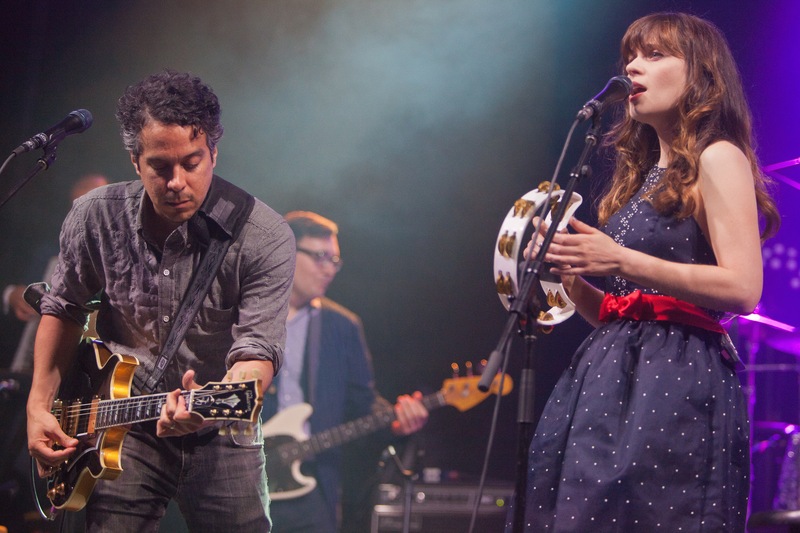 This entry was posted in Burden of Salt and tagged M. Ward, New Girl, photography, She & Him, She and Him, Toronto Urban Roots Fest, TURF, Zooey Deschanel on July 6, 2013 by Tom Beedham.